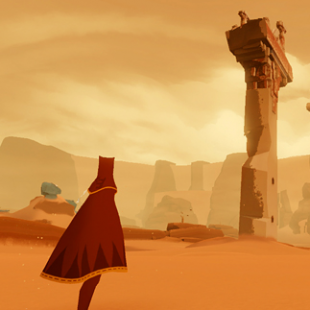 Journey developer cites its desert setting as key to the game's emotional experience. Be it the heat, the sand, or the ever present threat of giant sand worms, the desert is an environment that tends not to give people warm and fuzzy feelings of togetherness. Videogames don't do much to help this. In a game, the mere sight of a human body cresting a sand dune is more likely to inspire gunfire than cooperation. One title where this is not the case however, is Journey. Dropping players by themselves in a desert wasteland with nowhere to go but forward, the appearance of another player is less an opportunity for conflict and more a reprieve from an experience otherwise defined by isolation and loneliness. Gamers playing through Journey often stick with their randomly selected play-partners for hours, never even knowing who they were until the game's end. The experience is largely unique in the combat-centric world of videogames, and something that its developer, thatgamecompany, worked hard to pull off. According to Lead Engineer John Edwards, Journey's environment played no small part in the game's success. "There's this desire to connect with them in some way. To say hello," said Edwards, speaking at GDC. "You want to acknowledge them on a human level, which is somehow strangely uncommon in a lot of online videogames ... We thought the best environment for this would be a vast and barren desert." Wanting to make sure it had the best desert in the business, thatgamecompany took some unorthodox steps to ensure that Journey's development team was well acquainted with sand. The team took a trip to the beach to run, jump and play with sand. "When you go to the dunes [you'll notice] just how sparkly it is," Edwards said. "Pictures do not do it justice." Amusing as it is to think of a group of game developers spending a day building sand castles, their research would seem to have paid off. Journey launched to rave reviews and quickly broke PSN sales records.